St. Joseph's Parish was founded by Bishop John Dubois in 1829. The cornerstone of the Church was laid on June 10, 1833. 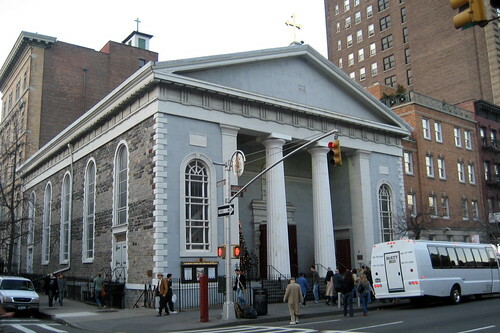 It is the second oldest Roman Catholic Church extant in New York City (after Saint Patrick's Old Cathedral). Built of Manhattan shist with a stuccoed front focusing on a Doric patio, by John Doran, it is one of the most beautifully proportioned Greek Revival churches in the city. A fire in 1855 caused extensive damage to the interior. The stained glass windows in the in the south wall remain as a legacy from 1879. One of them with the image of the Sacred Heart was donated by Father Thomas Farrell, Pastor from 1857 to 1880, an important figure in the history of the Archdiocese. The arched windows rebuilt after the fire remain from Arthur Crooks' rebuild. A restoration of the interior of the Church was achieved in 1972. During the restoration, the fresco of the Transfiguration, after Raphael's original in the Vatican, was discovered under layers of paint and restored.